I purchased one of those portable weather stations and installed it. it's really the first time that I've had an accurate measurement of what the weather is like around here. In the last 18 days I've gotten 9 inches of rain; so I'm averaging a half-inch of rain a day. Every day. That's a lot of water. I was looking at the "about us" section of a beef rancher, and he mentioned that his area gets 12 inches of rain A YEAR. At this rate I'll more than double his rainfall this MONTH. Since I installed this system on November 9th, I've gotten 22.5 inches of rain total, and that includes a dryer-than-normal November and December. I've been wondering how the water gets into the manure lagoon that I have... the mystery is solved. The clay liner prevents the rainfall from escaping, and just rain adds several feet to the water level. it's interesting, because the lagoon is basically an acre or so in size. So that means I've got about 10 acre feet of water -- which will sure come in handy if we have a dry spring or summer. The drought over the last few years, first in texas, and then in the midwest, and now in california and the western states, has resulted in fewer cattle being retained for breeding and smaller herd sizes. That's translating directly into higher prices for cattle at all ages. Calf prices right now are higher than I've ever seen them. Beef prices average $5/lb in the markets, and the prices keep rising. If you're in the position to be selling cattle now, either finished beef or feeder cattle or stockers, you're in a pretty darned good spot to get a bigger check than ever before. Now if you're in the position of buying, you're going to have to hunt hard for any bargains. I'd like to buy a few cattle this year, to feed out on my pastures I planted last fall, but these prices are really hard for me to stomach. Yep, I know there's good reason for it, and I know it's going to take years to provide more supply -- 2 to 3 years... but it's tough to put out that kind of money for a cautious guy like myself. If you're in the market for beef, you might want to accelerate your purchase. It's not going to get cheaper this year. Today was blustery and wet; a steady, cold 20mph wind with gusts up to 40... but things have to be done, and later in the year I won't have time for it, so fencing it is today. 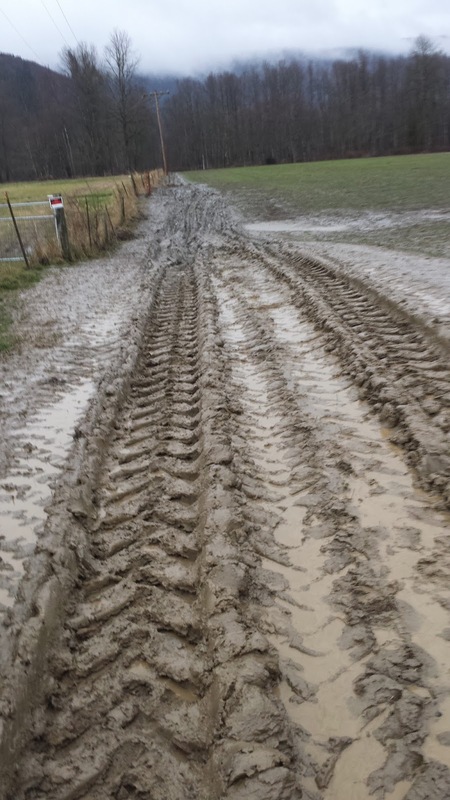 It's a bit hard to work; the mud is silky and sticky. Like half-melted butter. The tractor slips and slides; I finally have to kick it into four wheel drive to get some traction. My hands are cold, hard to make the knots as I tie the wires. Looking forward to having the fencing done; have another couple of thousand feet to do to complete the perimeter fencing. The last segments will go pretty quickly. They're long runs on flat, cleared ground. Careful to pick up all of the bits of fencing, and some litter that I find in the field. I like having a clean pasture, and it only takes a single nail or bit of wire to kill a cow. On the river end I put a couple of hog panels down to the current waters edge. I think I'm going to have to check this section of fence every time the river floods. Note: If you've been considering keeping bees and wanted to start this year, you'll need to order packages for delivery in late March or April in the next few weeks. Most of the local bee supply companies sell out of packages. Once that order is placed, purchasing, assembly and painting of your hives is a great rainy day project. I was out planting some grape vines and the bees reminded me that today was a pretty nice day. 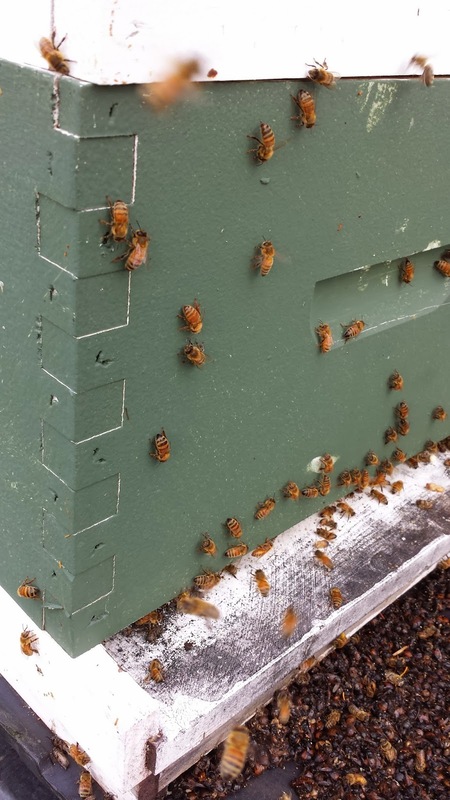 I was a bit concerned about this hive; they had a number of bees die off early in the winter (you can see them at the bottom left of the hive photo) but they've cleaned up their hive and are active and flying today; good numbers of young bees and they're actively pursuing pollen. 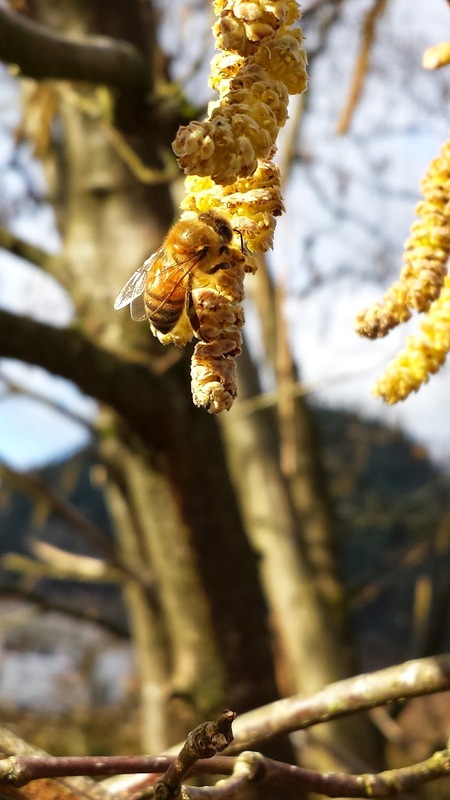 Pollen is a high-protein food that bees use to feed their young, and the source at this time of year is a grove of hazelnut trees that have large, showy stamens. The bees are carefully going over these trees and gathering as much of the pollen as they can. I'm glad to see it -- I'm hoping that they have a banner year. Bees don't hibernate over the winter; they huddle in their hives, sending a few workers out to check conditions from time to time, eating honey and waiting until it's flying weather. These bees start flying at about 45 degrees, and at 55 degrees most of the workers are out searching. Tree pollen is what's there at this time of year, and I suspect there's some nectar, too, but I don't know what kind. I'm just seeing bees return to the hive without pollen on their legs. Could be that they are just bringing water back, too, or trace minerals of some sort. For my bees this year I chose to leave the honey on the hive; I didn't know how much they'd need to over-winter, and they'll keep the honey in perfect condition. When the nectar starts flowing in earnest, april-may-june I'll pull the remaining honey off and harvest, leaving empty comb for the bees to refill. I purchased four packages last winter and 3 have made it this far. While I'm not happy that I lost one, you do lose colonies from time to time. The goal is to lose as few as possible. Jessica the gilt and "the thaw"
I was reading another blog and she mentioned that "the thaw" had come, and I thought about my farm. I don't really have a "thaw" to speak of because I don't have very much of a 'freeze". I actually like it better when it freezes hard. The mud firms up, it's easier to get around, the tractor doesn't sled around as much, and it's a lot easier to keep the house clean. Muddy boots are my bane. It's "the thaw" from November to June around here. 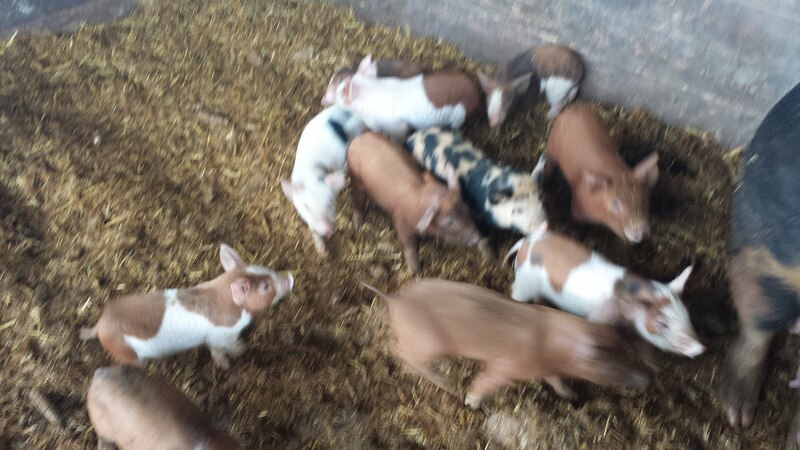 I got a call from a fellow and his wife that had found a piglet about 6 or 7 months ago. It was running around in their neighborhood, loose, and they couldn't figure out where it belonged, and they ended up working out a deal with their neighbor. They'd raise it between them and then split the pig when it came time. Unfortunately for them, pigs are endearing, and even more so when you name it Jessica. This pig got peanut butter sandwhiches and scratched and talked to, and as most pigs do when they're raised by themselves, the pig identified with and bonded with this couple. So when the day came they just don't do it. So I got a call, and I ended up trading this pig for a finished pig of mine. She was a fine looking gilt, and unrelated to my herd, and I agreed that I'd give her every opportunity to breed on my farm. 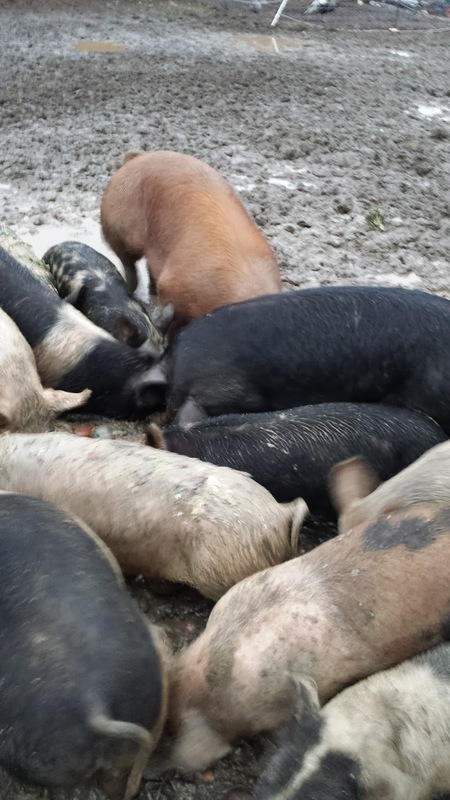 The thing about pigs that are raised on their own is that they really don't have much in the way of social skills with other pigs, and they certainly don't know how to lose gracefully to a bigger pig. So i kept her away from my herd for couple of weeks to make sure that she didn't have any signs of illness, and then started introducing pigs to her. First smaller pigs, and then working up over a couple of weeks to some good-natured full-sized sows. Good natured is a relative term, though. Jessica was used to being first in line for everything, and it's taken a while for her to realize that the top of the pyramid is a shaky place to be, particularly when there's bigger pigs around. So I've watched carefully as she learns the ropes with her larger teachers, and she's doing ok so far. She's being exposed to the boar now; she's being a bit shy about it, and I've got my fingers crossed that she breed successfully in the next few weeks. I like to recycle food as much as possible, and one of the things that I get offered a fair bit of is baked goods. It seems like a good deal, right? 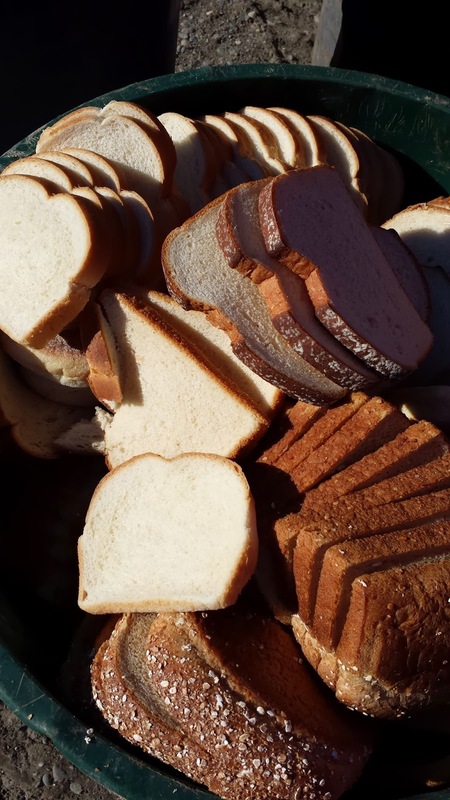 A couple of hundred loaves of bread for free! What's not to love? Well, the basic math I do is that it takes me time and fuel to go get it, time to unwrap it (because its usually individually wrapped...) and then time to feed it and dispose of the wrappings. So a loaf of bread is usually somewhere between a pound and a pound and a half. Right now feed costs for a balanced ration are about $0.19/lb -- $380 a ton. and at $0.19 a pound the feed mill delivers it to my door and puts it into the bin. So for this particular trip, I picked up 200 loaves. out of the 200 loaves I used 162 of them to cover the cost of the trip, leaving 38 loaves "profit". How much did I make? about $7. that is, I saved $7 off of the equivalent weight of feed. Except that loaves aren't a complete diet, a pig doesn't live on bread alone, so I'll use them to supplement the pigs diet. It stretches my purchased feed a while. But sometimes it really works out. In this particular trip I had a pickup truck and a trailer full of bread. Probably 2,000 baked items of all sorts. With that sort of math, your fixed cost as a percentage of your trip goes way down. My rule of thumb? Big quantities only. 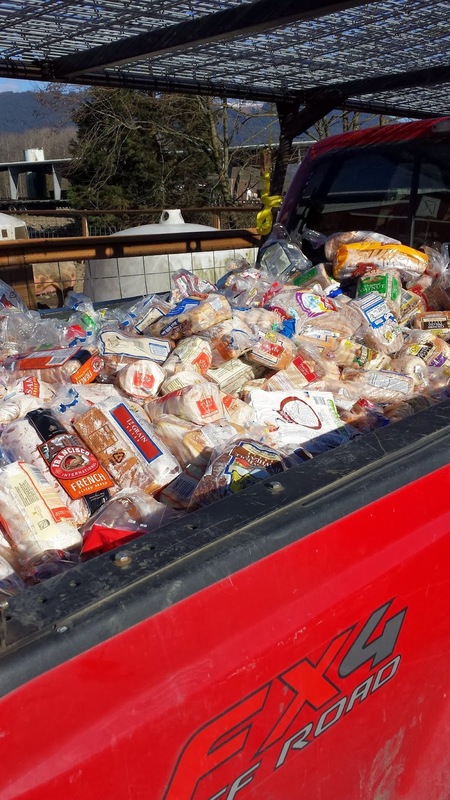 I don't pickup bread unless there's at least 200 loaves, but if I can make one trip and pick up thousands, even better! The wellhouse here is an old building that contains all of the apparatus for the pump and water treatment. Unfortunately, the setup isn't my favorite, or even good. They built the building and poured a concrete floor, and then ran the pipes in from the side. So the pipe comes out of the ground, goes up about 10", and then turns and goes into the wellhouse. That exposed bit of pipe can freeze, and I've had to repair/thaw the pipes a couple of times. Except this time I nearly burned down my wellhouse. The main water pipe that supplies water to the barns is a 1" galvanized pipe, and it transitions to a plastic pipe after it rises of the ground. The plastic froze and shattered, so I removed the broken pieces and made a new pipe. But the steel pipe going through the wall still had ice in it. 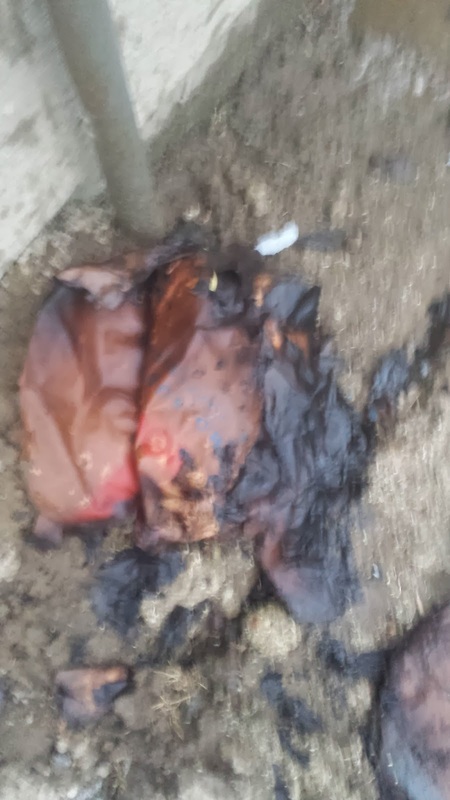 So I took a propane torch and working from the open side of the pipe heated it a little so that when I restored the pipe the water would flow. After doing that from inside, I went outside and did the same. Only I noticed when I was outside that there was a flickering light inside. Odd, I thought. 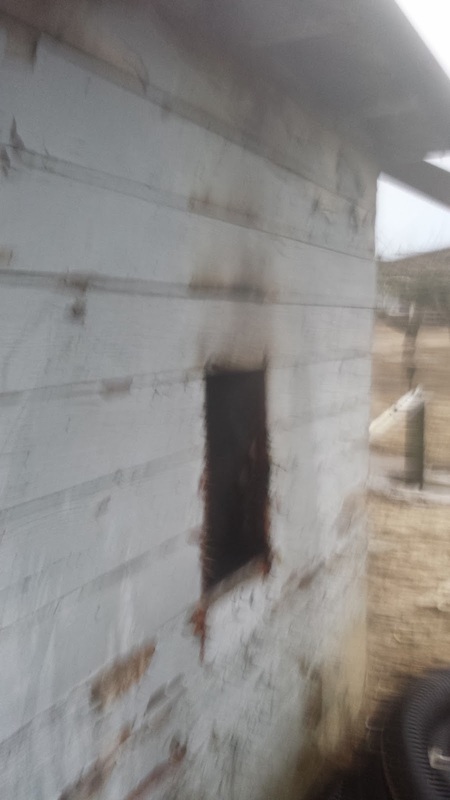 When they built this wellhouse they used tongue-and-groove 1x6 boards on the outside, then 2x2 wall studs, and then a piece of plywood on the inside. Between the studes they stuffed old paper sugar sacks. Bone dry paper crusted with sugar. My torch had lit this paper, and it was burning inside the wall! The water was off... but i had a busted pipe right there. So i grabbed a 5 gallon bucket and turned the water on long enough to get a bucket, and then tried... to... i couldn't get to the flames. it was between the wall panels. and now smoking pretty good. flames licking the ceiling. I ran over to my shop, grabbed my chainsaw and ran back. Alternating between pulling on the cord and cursing. "damn! start! damn! start! " 5 pulls and an eternity later it started and i quickly cut a hole in the wall between the studs. When I opened the wall flames shot out.. 7 buckets later it was steaming but out. Don't insulate your buildings with paper. and install fire blocking! One nice thing about this area is that we have a marine climate; it usually doesn't get too cold, or too hot. Perfect for growing grass nearly year-round. But it does get cold for a few weeks a year, and this is that time. Most of the year I use automatic waterers for the animals; they're relatively cheap, $10 to $20, give the animal as much water as it wants, and keeps the water they drink clean. Troughs or bowls aren't my favorite, but at this time of year, that's what we switch to. A hose or bucket, and a pitchfork. The routine is the same every morning. 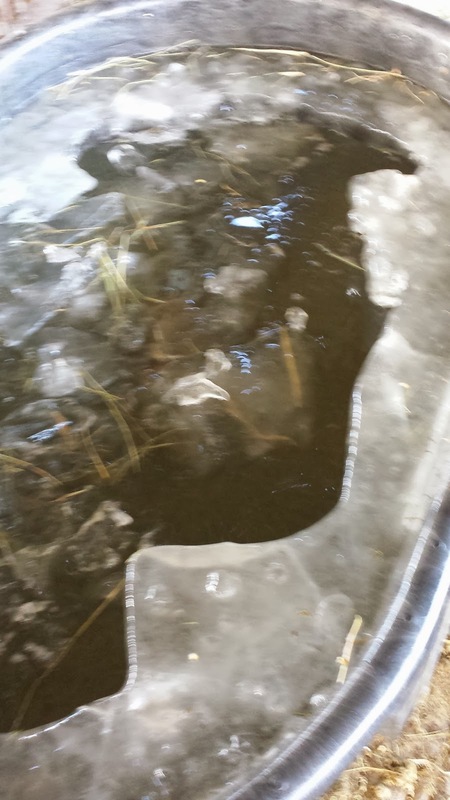 Break the ice on the trough, use the pitchfork to pull the big pieces out, refill, and repeat. Every day. Until the cold snap ends. On this new farm I've got the luxury of electricity, and I've thought about getting a heated water system, but haven't found one that looks good to me. I think i'll need one system for the cows, and another for the sheep/pigs. 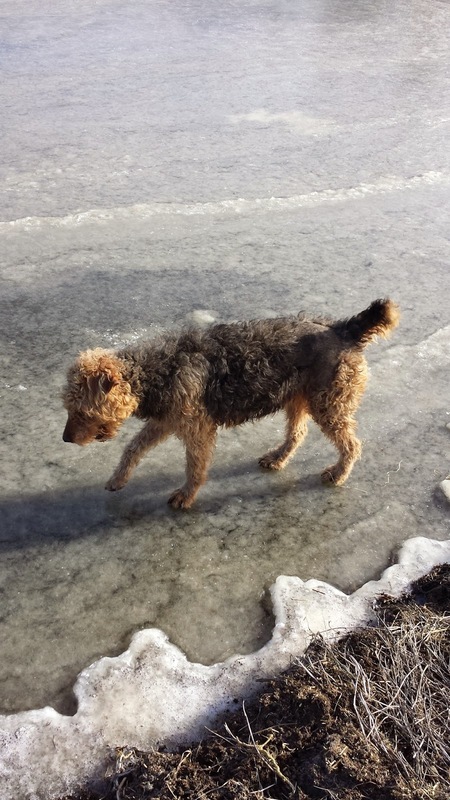 the dogs are finding the ice to be a new experience; they're tentative about going out on it, but the've been doing so to get closer to the ducks that are in the open water at the center. The ducks don't approve; and sometimes will fly away, sometimes they'll just watch the dogs. Maybe they're hoping they do jump in. When you own a farm, there's a set of values that you pretty much hold in common with other people who are farming. When your neighbors are doing the same kind of thing that you are, there's an understanding that comes from having walked in their boots, and they in yours. I've got a neighbor who purchased a large chunk of farmland, and confessed to me that he's a bit overwhelmed. He leases out part of the land to a local farmer to produce field crops (wheat, silage corn), but won't let the guy fertilize the fields with manure or use some sprays, which isn't by itself a bad thing, but it's a little bit of what I'm talking about now. There's this thing we have when farmland borders a city, where it's desirable to, for lack of better term, conspicuously consume farmland. Take a bunch of productive land and make it into a horse emporium, for instance. 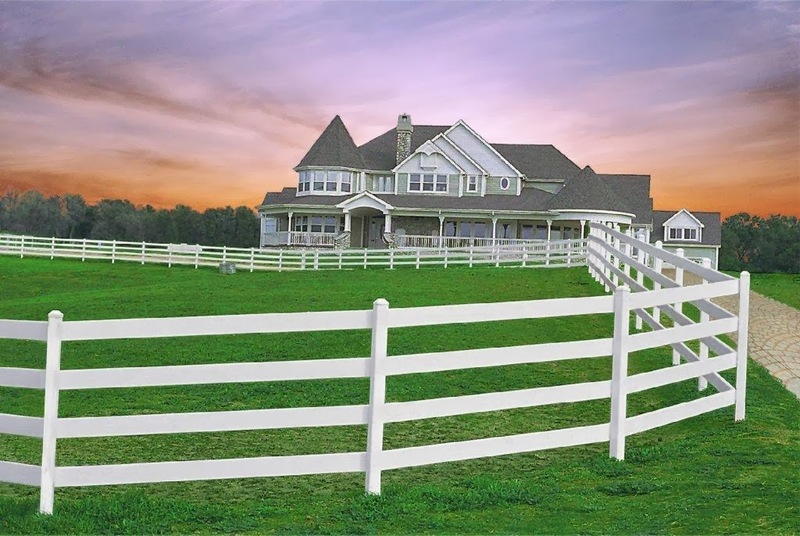 I see a lot of these around here; I call them the white-fence farms. While they may fill out a schedule f, they're not about making a profit or producing a crop, but they're more about image. I must be a good farmer if I have a quarter mile of white fence; the white fence is the important part. The big house is optional. 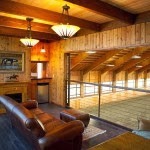 Sometimes you see a little house and a giant horse barn or indoor riding arena. So in my case, he's purchased 85 acres that used to be leased to the farm that I own, allowing the dairy here to run more cows -- you need a certain number of acres per cow to spread the manure, and the operator here was using every single acre. But the new owner doesn't like the smell of manure, and doesn't like the cows, and, well, it is his land. So I've had animals get out of my fences as I've constructed them, and while I do my best to keep them contained, that's going to happen from time to time. Anyone who's ever kept animals understands that; and I can't count the number of times I've helped round up someones loose steer or a cow calf or a couple of goats. But the residential users just consider this to be a nuisance. One day I was out trying to figure out how my seeder worked earlier this year; and the wife of the neighbor rolled up in her car and said "hey, your cows are on our pasture!" - and I said ok, but there in a bit, and continued to work on the adjustment so I could get it to a place where I could set it down and chase cows. And she rolled away 50 feet and then sat and watched me. I could feel her eyes on me, but I really didn't want to lose my train of thought, and no matter what the cows were doing, I didn't think 5 minutes would hurt. But as she watched it was distracting; she drove her car up again and said "they are eating my flowers!! they are by my house!! come get the cows!!" So I'm counting to 10 and gritting my teeth and I said "I'm going to finish up right here and I'll be over directly, but I may take another 10 to 15 minutes" and she was astonished. I finished up and and I put down my stuff, and I walked the .25 mile to where the cows were -- hundreds of feet from her house, eating the grass in a pasture, and I shooed them back over to my fence, and closed the gate someone had left open. What was different was that a farmer would have just called me from their kitchen (my cell phone was in my pocket) and I would have said be there directly, and 15 minutes later I would have been. For a farmer, cows eating grass isn't an emergency. You don't cry wolf. Yes, she's right that my cows shouldn't be on her land. Agree. But her assumption that I was going to drop everything and sprint over to save her grass seemed a little excessive. And I still don't know who left the gate open. Meter reader maybe; although we had a little talk about that already. Everything is an emergency with the residential folks. A piglet is out messing around on the side of the road? Horrors! A cow is eating their grass? Unforgivable! Heaven help me if the sheep get out. This particular neighbor had the same sorts of conflicts with the previous owner of this farm, and his idea was to surround his property with evergreen trees, spaced 2' apart. 500 or 600 of them along our property line. That's not a choice a farmer would have made. How about a darned fence, Vincent! Or a gate! those trees don't stop anything. It's a different mindset. The fellow that owns the property mows his driveway and yard more than any human I've ever seen. three times a week sometimes. He offered to mow my yard, and I said "why on earth would i waste good grass by mowing it? The sheep will clean that right up and I get to eat the sheep" He laughed, but it goes to illustrate that we are coming at the same issue from a completely different place. Snohomish county has had a lot of this sort of conflict as it transitions from a farming powerhouse to a bedroom community for boeing and microsoft and amazon. So many that when you buy land that is either zoned agricultural or next to land that is, you have to sign a notification about the land you are buying. The hope and aim of this sort of disclosure form is that it will eliminate or reduce conflicts between normal farming activities and residential uses... and I'm sorry, but if your riding arena viewing area is nicer than my living room, that's a residential use. So in my case I grit my teeth and build the fencing, but I know that it's just a matter of time before something gets out, or something isn't to their liking -- wait until this summer when I'm emptying the manure lagoon, for instance -- and I'll have more education to do.